Famous park on the north edge of central London. It is the part-built idea for a grand garden suburb, designed by John Nash (1752 - 1835), for the Prince Regent (later to become George IV). 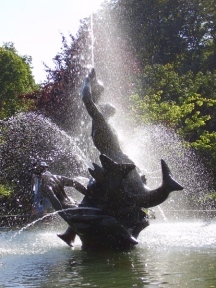 What was built, and still survives, is all recognisable as part of Nash's vision, where creamy-pink stucco Regency houses face elegant park and gardens. The whole lot is now Grade I listed, down to the last lamp-post and bollard. 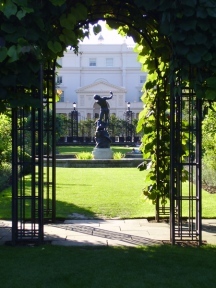 Garden areas include: the AVENUE GARDENS - A pair of formal gardens which sweep half way up the Broad Walk. Italianate in style, immaculate with fountains, shallow urns known as 'Tazza's' and clever ideas for bedding out. These gardens were laid out in 1864 to a design by William Nesfield, a prominent Victorian garden designer. However, over time the gardens had deteriorated and in 1993/4 were wonderfully restored as a prime example of their kind and are award-winningly maintained. 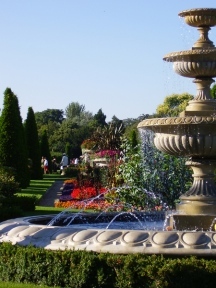 QUEEN MARY'S GARDENS - A series of gardens within the Inner Circle, including Queen Mary's Rose Garden, a Fossil Garden, the Sunken or Begonia Garden, a Woodland Garden, Rock Garden, pond, waterfall, cascade.... 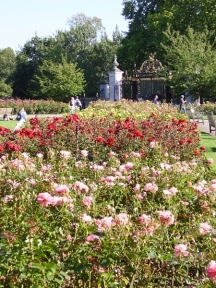 The Rose garden is a large area encircled by rose - festooned rope swags. This stands at the head of a series of rose gardens, in all growing around 30,000 roses - the colour and scent a feast for the senses. Beyond these lie the pond, cascade, rock garden and fossil garden. The sunken garden has a formal layout of bedding, secluded by a clipped yew hedge. There are many mature specimen trees, such as Swamp Cypress (Taxodium distichum) and Manna Ash (Fraxinus ornus), and a wide variety shrubs and herbaceous plants; the herbaceous borders are particularly well stocked. Despite its age, and many years of establishment, the garden feels alive and vibrant, with areas being rejuvenated as necessary and all immaculately kept. ST JOHN'S LODGE - is an elegant town garden overlooked by the handsome building of St John's Lodge, designed by Decimus Burton, also as part of Nash's plan. It is easy to walk past the wide passage interspersed with several metal pergola hoops which leads down to the main garden. Here herbaceous borders edged with lavender lead to a series of three circular gardens, each enclosed by pleached lime. A charming, secret garden. "A beautiful and well kept huge public park"
"A great place to meet up with friends at lunchtime"